An Intellectual Property (IP) lawyer is a legal expert who specializes in intellectual property law. His responsibility involves securing as well as enforcing constitutional rights to inventions, designs, logos, and artistic work. These professionals help clients in several different ways, including forming and protecting intellectual capital. Most IP lawyers deal with the entire gamut of matters ranging from copyright, patents, and trademark law to franchising, licensing, and dispersal to technology handovers and trade secret tasks. If you are planning to explore the business opportunities in this area, we are here to help you! The Intellectual Property Lawyer Email List from Blue Mail Media makes it easy for you to reach various professionals and give you the right platform to interact with them seamlessly. Since our list obeys all the guidelines of GDPR and Anti-Spam law, you can use them in your marketing activities with no fear. We continually improve our strategies to ensure the best data possible for your business needs. Our Intellectual Property Lawyers List is perfect to Explore New Opportunities! Blue Mail Media is well known for offering the most accurate and validated Intellectual Property Lawyers Email Database. We provide all the essential marketing information required for a client, right from the prospect’s name to a geographic location. Our list comes in both pre-packaged and customized format. This customization option helps you in building a targeted list of lawyers based on your next marketing requirements. You can choose from a varied search selection including location, company size, revenue, SIC Code, NAICS Code, and many more. Our data specialists collect compiles and manages all these data from multiple credible sources all over the globe. Besides, our Intellectual Property Lawyer Mailing List also contains the data of lawyers from several parts of the world. It includes North America, Australia, Europe, Asia, New Zealand, Africa, the South America and Middle East. 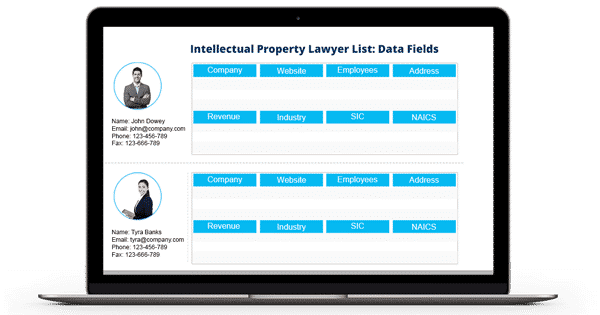 The information we provide in our Intellectual Property Lawyers List is ideal for email, direct mail, telemarketing, market research and much more. Avail our robust Intellectual Property Lawyers List in your area that can help you with different issues from copyright to trademark to patent and licensing. So if you wish to improve your company’s revenue, contact us today and get the free quote. You can either dial 1-888-494-0588 or email us at sales@bluemailmedia.com to know more about it.